1.2 Raw juice heating by Condensate heater for 2nd stage. 1.3 Use Tubular heater with dynamic effect on 4th vapour for raw juice final heating. 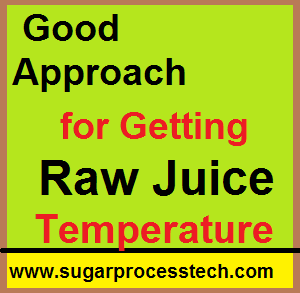 Raw juice temperature raised upto 70 to 75oC is the 1st step in Sugar processing. For obtaining this temperature follows two to three stages heating with different types of heaters like tubular heater, direct contact heaters and plate type heater by using different heating media. In this article discussed best approach for raw juice heating. In the concept of waste heat recovery, from vapour line juice heater is the one of the most impartent equipment. Here raw juice can heat upto 45 to 55oC . In vapour line juice heater heat transfer coefficient is very high when compare to dead end type juice heater due to its dynamic vapour effect. While maintained 5th body temperature by using condenser automation, it will helpful to constant maintaining of syrup brix and getting maximum temperature of raw juice in VLJH. And also helpful to reduce load on condenser. Raw juice heating by Condensate heater for 2nd stage. The condensate temperature getting upto 80oC after the flash cigar system but our process hot water requirement inbetween 60 to 65o . So this excess heat energy used for heating the raw juice 2nd heating. In the condensate heaters design criteria Duplex type heater design is one of the most efficient type heaters. In the duplex design heat transfer coefficient is very high when compare to normal horizontal type heaters. So in duplex design heating surface requirement is less when compare to other type of tubular heaters. Use Tubular heater with dynamic effect on 4th vapour for raw juice final heating. Generally dead end and dynamic type tubular heaters are used in sugar industry. In the dynamic effect the heat transfer coefficient is high when compare to dead end type heater and also getting the temperature approach in dynamic effect upto 5 to 6oC. So that 4th vapour is sufficient for getting raw juice final temperature. When compare Direct Contact heater(DCH) & tubular heater for final raw juice heating with same vapour bleeding, tubular is one of the good option regarding to steam economy because while using DCH getting the extra condensate load on evaporator set. Juice Defecator and Juice Sulphitor Design Criteria | Online Calculator | Design Calculation of Juice Defecator and Sulphitor with online calculator. Juice Sulphitation Process | Methods of Sugar Cane Juice Sulphitation | Reactions and methods of sugar cane juice sulphitation process. Flash Vapour Calculation | Flash Vapour Recovery Vessel Design Calculation. Condensate flash vapour recovery system calculation with example. Heat Transfer Coefficient of Liquid -Liquid Tubular Heater Calculation| HTC | How to find Condensate Juice Heater Heat Transfer Coefficient Calculation. Please describe, how to calculate the heat transfer coefficient for dynamic juice heaters. juice heater heat transfer coefficient calculation in sugar industry.